The base is complete! 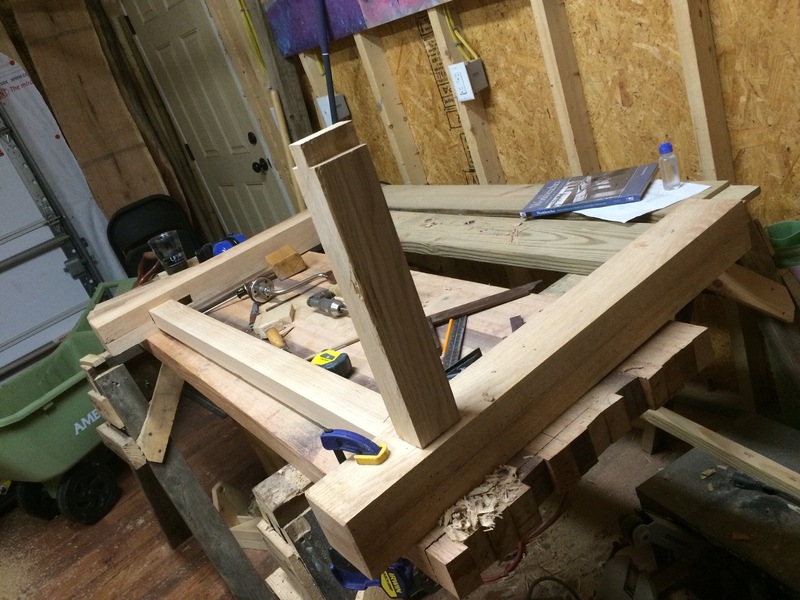 Last night I finished drawboring the side stretchers into the two sets of legs. A total of 8 mortises that I cut by hand – something I find really enjoyable. 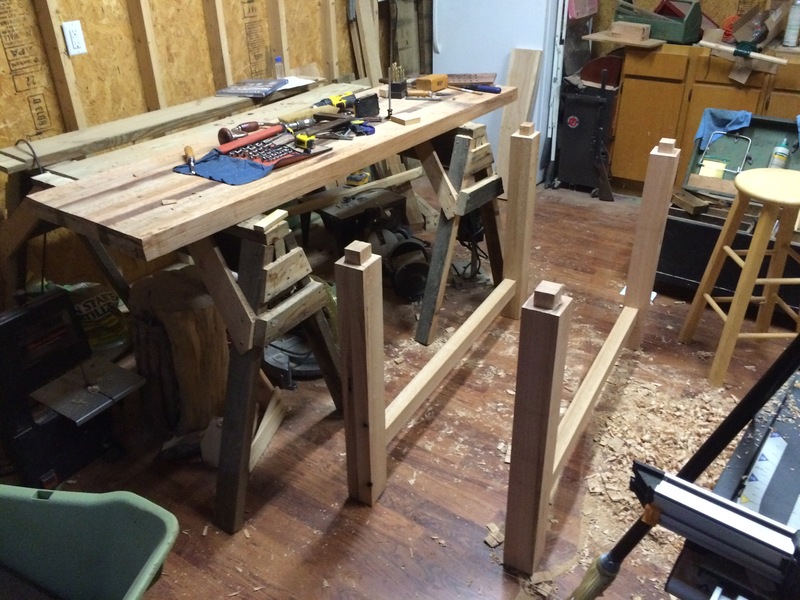 I cut the leg tenons and long stretcher tenons by hand, and the small stretcher tenons on the table saw. 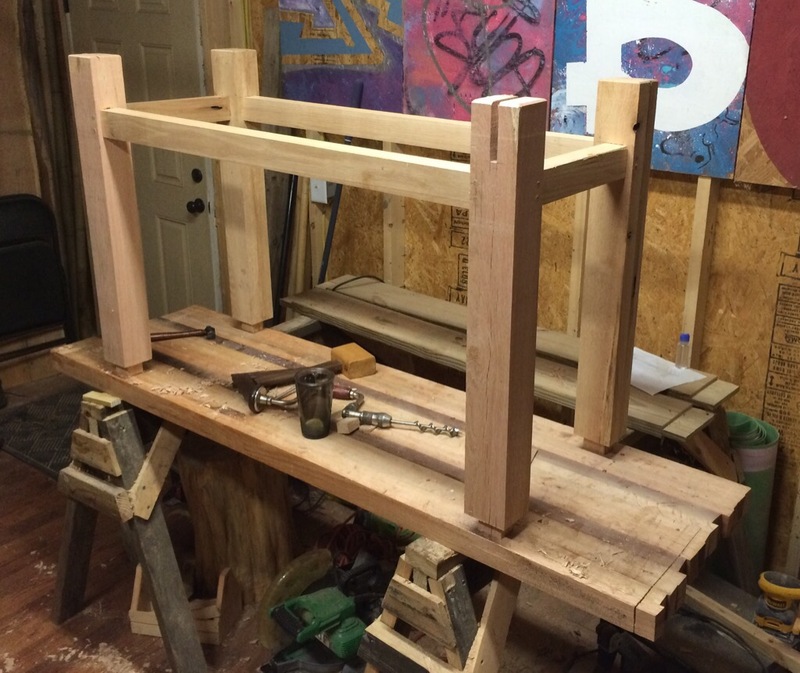 True hybrid woodworking! 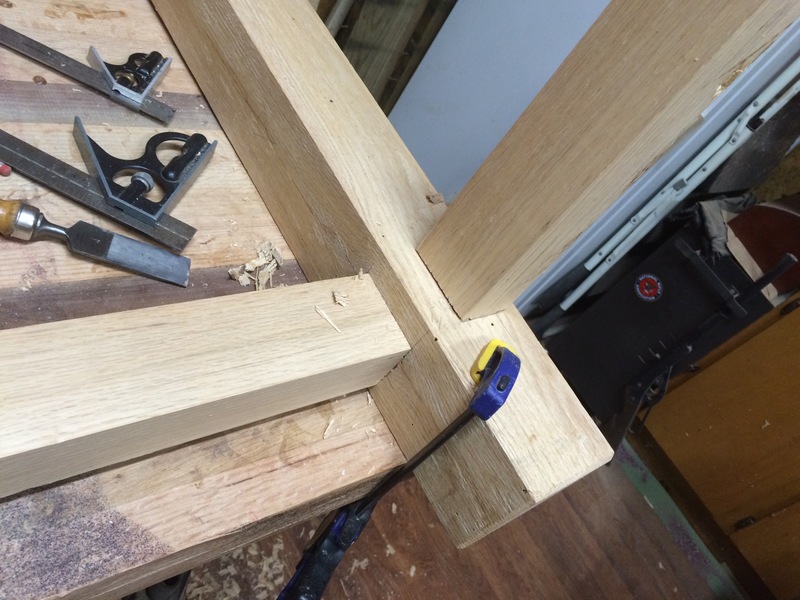 I placed these mortise for these stretchers 1″ in from the outside of the leg. This makes the stretcher inset about half an inch. In retrospect, I should have just made them flush, but I was thinking I would beef them up if I add a deadman. Bad idea, I could have just added a top piece for the deadman. Ah well, live and learn. Got great use of my great-grandfather-in-law’s (!) 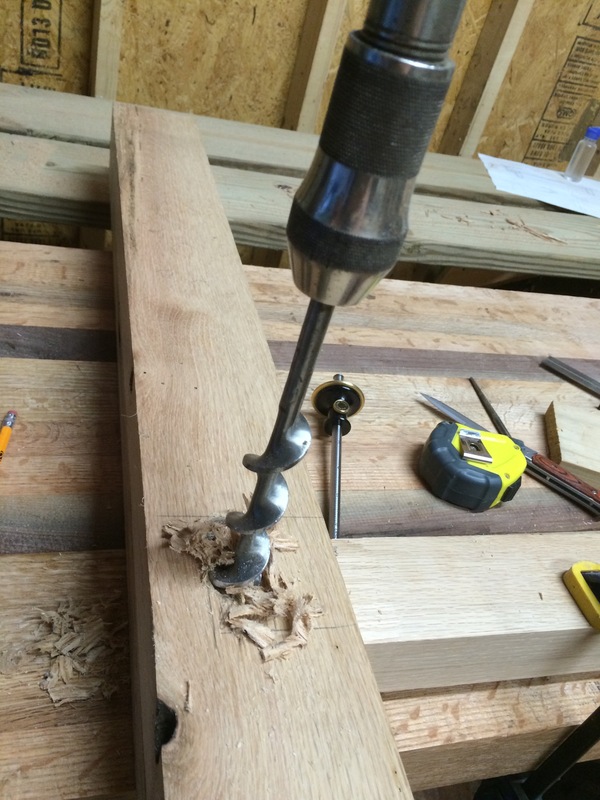 brace and bit and auger bits. They were beasts, but need to be sharpened after all this. Which, I don’t know how to do. Post draw-boring. You are looking at the back legs (I placed the laminated posts in the back). So far, so good on the draw-boring. I have yet to have a pin explode, but I suspect that a few pins have not made it all the way through their tenons into the other side. However, for each leg I’m fairly confident that one if not both pins have, so I feel good. All but one stretcher was draw-bored without glue (creature of habit when I did the first one). Getting close! 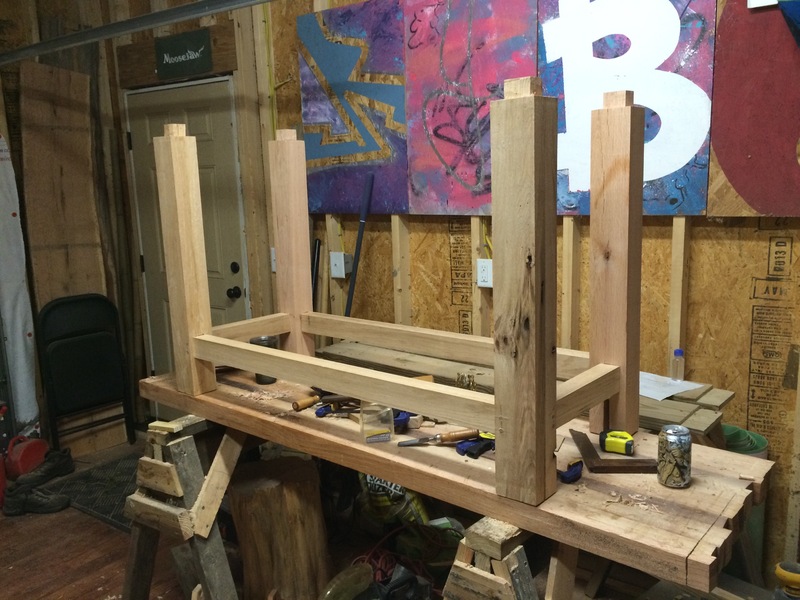 Next up will be flattening the bench, cutting the huge mortises, and attaching the base.